Sarah Clelland brings you 50 scone recipes from the National Trust. History is best enjoyed with a scone, as everyone who's visited a National Trust house knows. This book brings you the best of both. 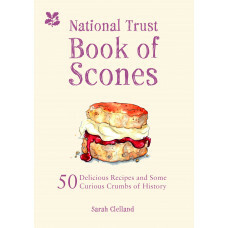 Scone obsessive Sarah Clelland has gathered 50 - yes 50 - scone recipes from National Trust experts around the country. And she's written a quirky guide to 50 National Trust places to delight and entertain you while you bake or eat those blissful treats. Eccentric owners, strange treasures, obscure facts - it's all here. Whip up a Triple Chocolate scone while you read about the mechanical elephants at Waddesdon Manor. Or savour an Apple & Cinnamon scone while you absorb the dramatic love life of Henry Cecil of Hanbury Hall. Marvel at a Ightham Mote's Grade 1 listed dog kennel while you savour a Cheese, Spring Onion and Bacon scone. 50 of the best scones in history. And 50 of the best places to read about. You'll never need to leave the kitchen again.